Team sessions are the perfect way to get an edge on your competition. Tailored to your sport, age group and gender, sessions can be delivered at the Core Advantage High Performance Centre or your home facility. Being the best is about more than just training harder. Whether it's in the warm-up, in the gym or even in the kitchen, so often contests are won or lost before they even start. By combining our 30,000 plus hours of coaching experience and the latest research and evidence from the cutting edge of sports science, our workshops blend practical advice with easy to understand scientific principles so that athletes and coaches can take immediate steps towards improved performance in the long and short term. All Workshops are sport specific and are tailored to athlete age group. Workshops are suitable for athletes 13 years and older unless otherwise stated. Below are some example workshop topics and suggestions all of which can be delivered in-house at the Core Advantage High Performance Centre or at your home facility (if suitable). Book a phone call for more information or to develop a workshop tailored to your group. To measure is to know, using the latest sports testing technology our team can test your athletes providing them with insights into their strengths and weaknesses. With testing combines for almost all sports, we will not only take your athletes through their athletic tests but also help them analyse and interpret the results. Sleep, nutrition and taking care of your body are essential parts of being an athlete. 10-30 Athletes. Delivered at the Core Advantage High Performance Centre or your home facility (projector supplied by us, we just need power). Developed and refined since 1999 Warm up 2.0 is our solution to preparing your body and mind for training and competition with an eye on the big picture of long term athletic development. Warm up is a tremendous opportunity for improving the athletic qualities of your entire team or club. Get it right and watch your injury rates go down whilst performance goes up. We offer custom workshops tailored to your team based on sport, age group and gender. 10-20 Athletes. Delivered at the Core Advantage High Performance Centre or your home facility (projector supplied by us, we just need power). In team and ball sports so often the fundamentals of movement are overlooked. We can teach your athletes how to run, jump and cut more efficiently, effectively and safely, improving their explosive power, fitness, and reducing the risk of injury. With so many conflicting methodologies, myths, bad science and schools of thought when it comes to lifting weights it can be confusing and challenging to know what is right. Allow us to help distill the best information from the myths associated with adolescents and weights training and help your athletes stay safe in the gym while also getting the most out of their strength training. 10-20 Athletes, 16 years old and up. Delivered at the Core Advantage High Performance Centre or your home facility (must have a weights room), (projector supplied by us, we just need power). While we are not nutritionists (and don't pretend to be) there are many highly beneficial fundamentals we can teach to all athletes to help them power elite performance on game or race day. 10-40 Athletes. Delivered at the Core Advantage High Performance Centre or your home facility (projector supplied by us, we just need power). In this session we dive into this often confusing area and help athletes sort the good from the bad. 10-40 Athletes 16 years old and up. Delivered at the Core Advantage High Performance Centre or your home facility (projector supplied by us, we just need power). 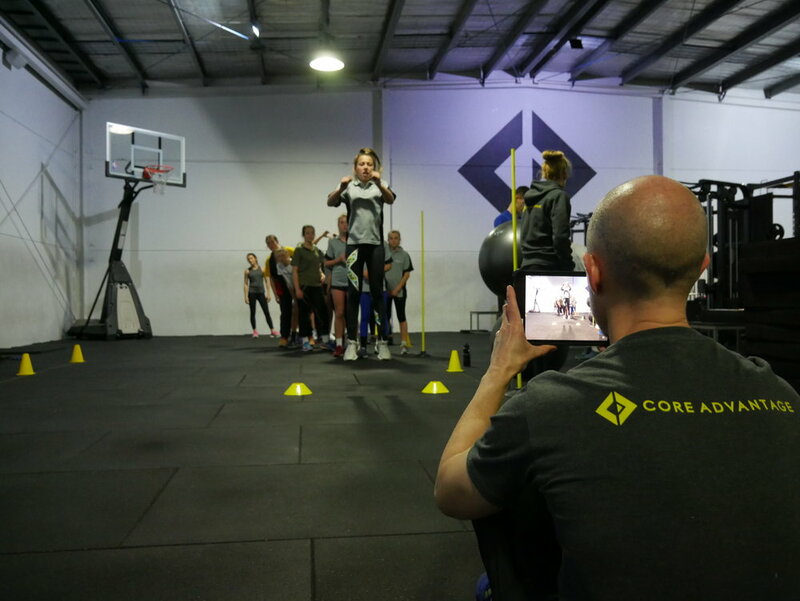 Either in-house at the Core Advantage High Performance Centre or at your home facility, Core Advantage will work together with your coaching staff to develop a battery of tests to capture a snapshot of the strengths and weaknesses of your team as a whole and of each individual in it. Within one week of the testing session we provide you with hard and digital copies of individual and team results. From there, we will help you interpret and analyse the results, providing your team with a concrete action plan and resources to help your athletes maximise their overall athleticism. Follow-up testing sessions can be used to track and highlight improvements in athletic performance over time. We offer different testing batteries for every sport based on the unique movement patterns, energy systems used along with data on elite standards, common combine tests and injury trends/risk factors within each sport.